The other day, I was craving barbecue chicken real bad. It’s got to be one of my most favorite chicken dishes, but it was a particularly hot day and I didn’t want to go into a whole huge deal to make it. Sometimes, you want it uncomplicated, like I did. You just want it easy, you know? And that’s where this Instant Pot pulled barbecue chicken recipe comes into play – because it’s uncomplicated, easy, and you can effortlessly double or triple this recipe for future meals. Plus, I don’t know about you, but I don’t want to use the oven AT ALL in the summertime. I want dinner to be prepared in alternate ways, but there’s only so many times you can use your grill without getting bored. Break out the slow cooker and Instant Pot, baby! Go with an easy salad or slaw for your side dish, y’know? Summer + easy recipes, baby. The less effort, the better. I love how you can easily double or triple this for the future, too. And with all the leftovers, perhaps create a pulled barbecue chicken wrap? Or leave it cold for a pulled barbecue chicken salad with ranch on top? Yum! 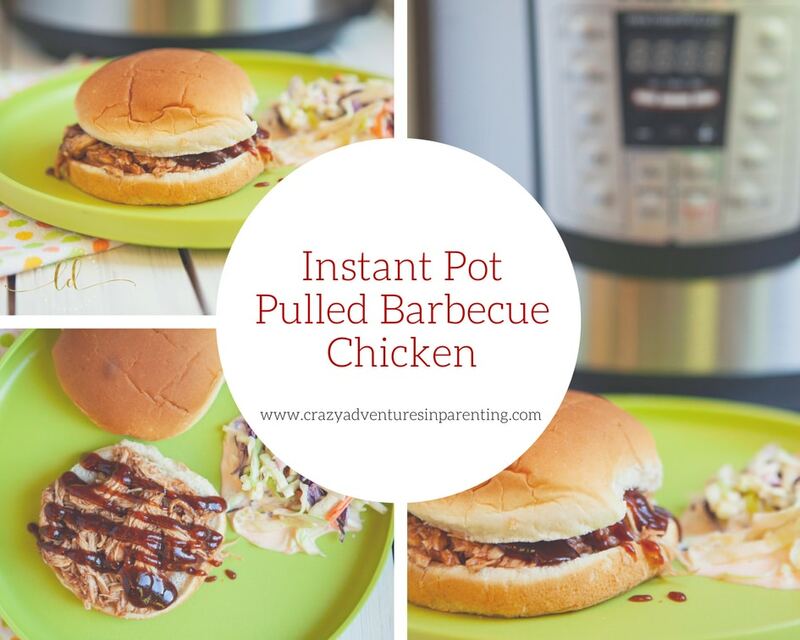 To make this Instant Pot pulled barbecue chicken awesomeness, let’s break out our cast of characters for the recipe. Chicken, check. Fave barbecue sauce, check. Water, check. Seasonings in a bowl, check. Find a comfy yet small area out of the way for your workspace, too. Less complicated doesn’t have to mean a ton of cleanup, y’know? Working right near your Instant Pot will work just nicely. Let’s get those seasonings all together in the bowl like so. I’m all about the seasoning, baby. Get ’em all niiiice and mixed up so you can fancy-up your chicken breasts. It isn’t just barbecue sauce, y’know. Sprinkle generously on each breast, but evenly. Once bowl is empty, rub those seasonings into each of the chicken breasts. They should be nice and coated when you’re finished! … and then pour water in. Place your chicken breasts one at a time on the rack inside the Instant Pot. Set the time for 25 minutes. And WALA! 25 minutes later, beautifully seasoned chicken is ready for a-shreddin’! Place your chicken breasts in your seasoning bowl and, with two forks, shred shred shred! Shred ’em up reeeeeeeal nice. Drain a bit of the juices from the Instant Pot, then add barbecue sauce into the remaining juices. Add in your shredded chicken so you can mix ’em. Stir stir stir, get it real good and mixed. The better you shredded earlier, the saucier it tastes. Yum! Take spoonfuls and place onto your sandwich buns. Look at that barbecue chicken deliciousness, omgahhhh! I’m #teambarbecue and believe you can NEVER have too much. I mean, I need it DRIPPING off my sandwich, man. This Instant Pot pulled barbecue chicken recipe is as easy as it is delicious and you can effortlessly double or triple this recipe for future meals. Mix together salt, garlic powder, onion powder and pepper into a bowl. Using your hands, rub seasoning over the chicken on both sides. Place wire rack in your Instant Pot. Pour water into the pot. Touch the manual button and cook at high pressure for 25 minutes. Once the timer goes off use the quick release to release the pressure. Once the pressure is fully released, take the chicken out. Using two forks, gently shred the chicken. Take ½ cup of leftover juices from the Instant Pot and set aside. Dump the rest out. Put the ½ cup juice back in the pot with your BBQ sauce. Mix well. Add shredded chicken and mix until well coated. Serve warm on a bun with cole slaw! I just.. I’m in love, you guys. Not just with this sandwich, but with this Instant Pot, too. Check out my other barbecue recipes, too! The BEST Barbecue Ribs Ever!